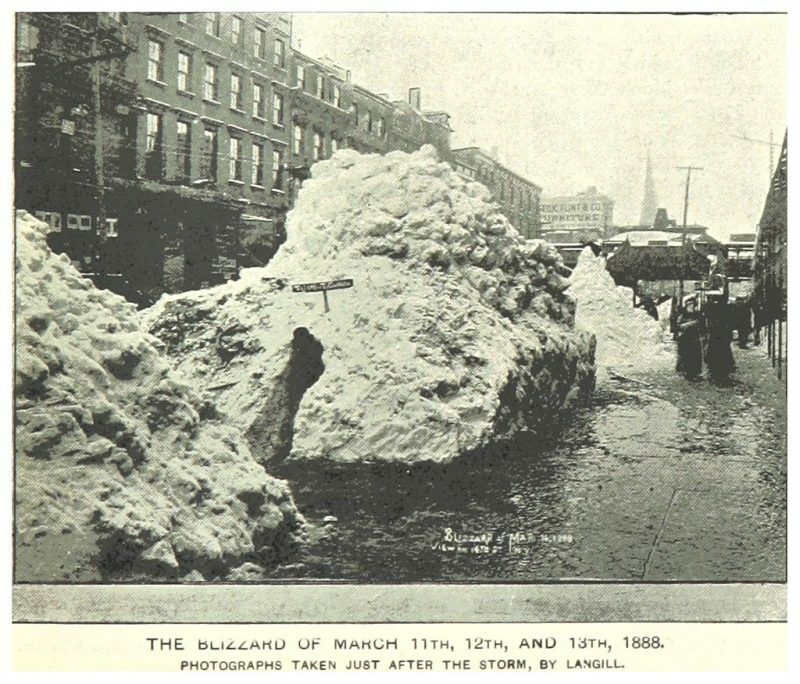 The Great Blizzard of 1888 was one of the most severe recorded blizzards in the history of the United States of America. 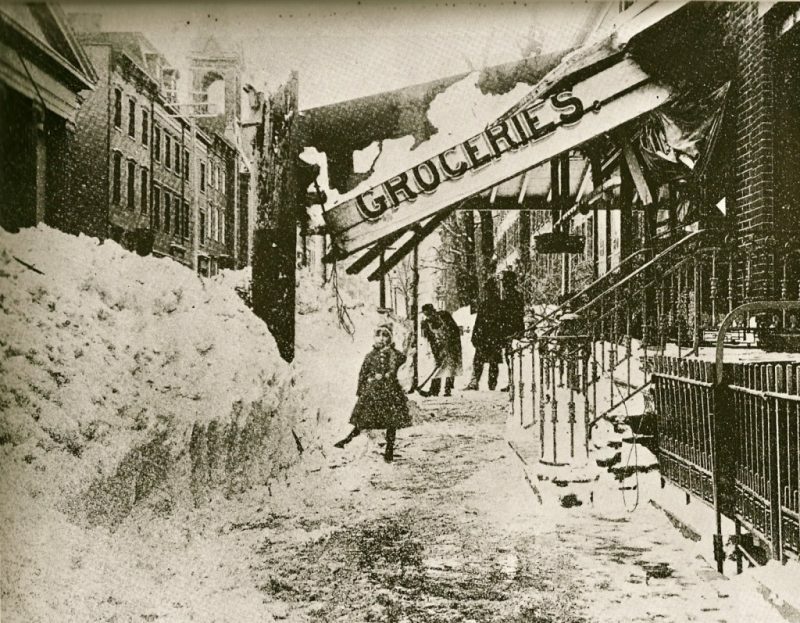 Snowfalls of 20–60 inches (51–152 cm) fell in parts of New Jersey, New York, Massachusetts, Rhode Island, and Connecticut, and sustained winds of more than 45 miles per hour (72 km/h) produced snow drifts in excess of 50 feet (15 m). 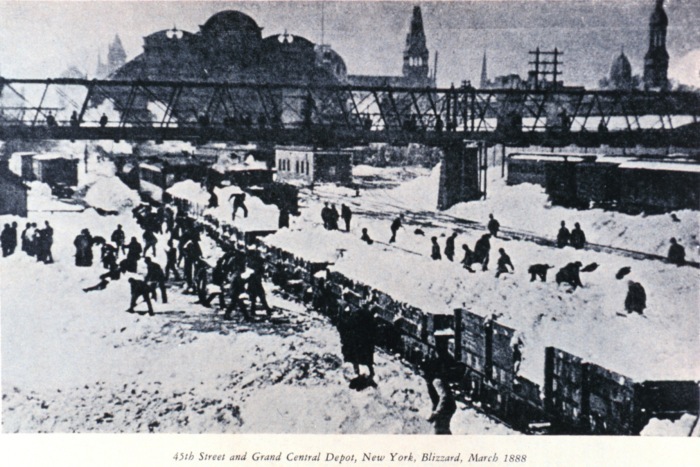 Railroads were shut down and people were confined to their houses for up to a week. 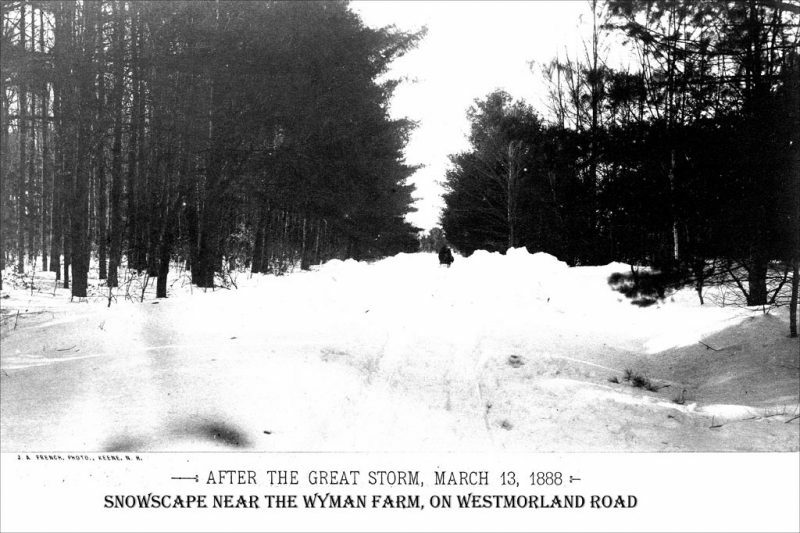 The weather preceding the blizzard was unseasonably mild with heavy rains that turned to snow as temperatures dropped rapidly.The storm began in earnest shortly after midnight on March 12, and continued unabated for a full day and a half. The National Weather Service estimated this Nor’easter dumped as much as 50 inches (130 cm) of snow in parts of Connecticut and Massachusetts, while parts of New Jersey and New York had up to 40 inches (100 cm). Most of northern Vermont received from 20 inches (51 cm) to 30 inches (76 cm) in this storm.. 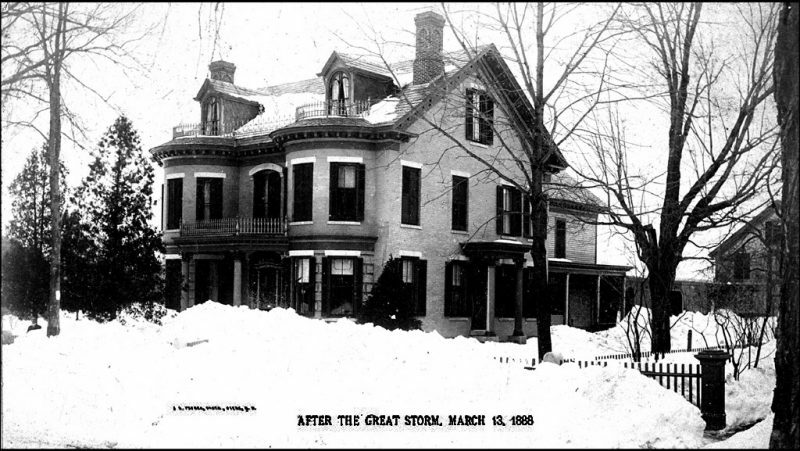 The storm, referred to as the Great White Hurricane, paralyzed the East Coast from the Chesapeake Bay to Maine, as well as the Atlantic provinces of Canada. 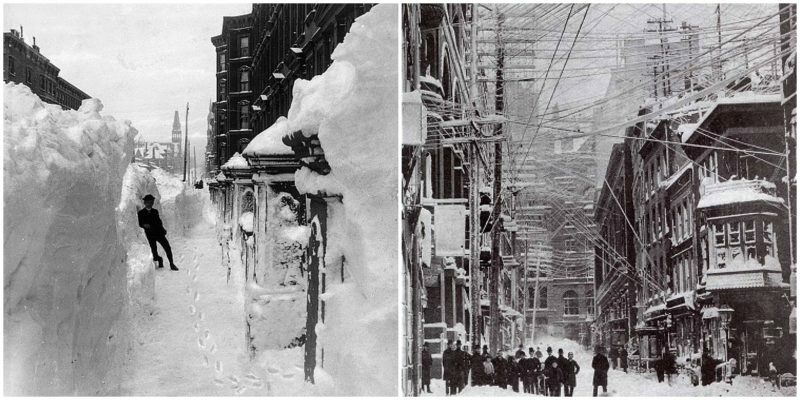 Telegraph infrastructure was disabled, isolating Montreal and most of the large northeastern U.S. cities from Washington, D.C. to Boston for days. Following the storm, New York began placing its telegraph and telephone infrastructure underground to prevent their destruction. From Chesapeake Bay through the New England area, more than 200 ships were either grounded or wrecked, resulting in the deaths of at least 100 seamen. 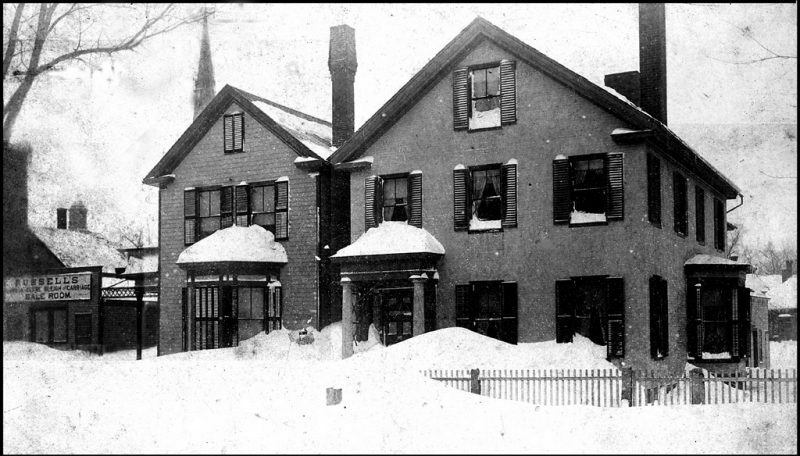 Drifts were reported to average 30–40 feet (9.1–12.2 m), over the tops of houses from New York to New England, with reports of drifts covering three-story houses. The highest drift (52 feet or 16 metres) was recorded in Gravesend, New York. 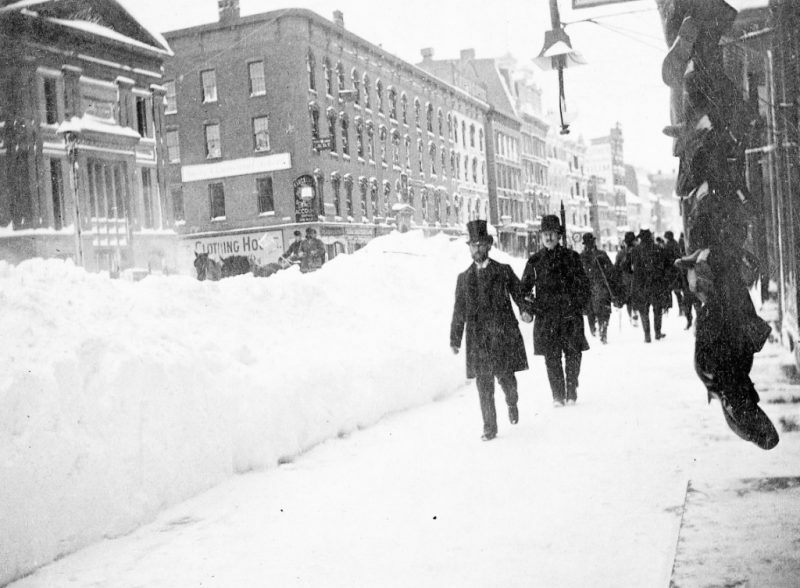 It was reported that 58 inches (150 cm) of snow fell in Saratoga Springs, New York; 48 inches (120 cm) in Albany, New York; 45 inches (110 cm) of snow in New Haven, Connecticut; and 22 inches (56 cm) of snow in New York City. The storm also produced severe winds; 80 miles per hour (129 km/h) wind gusts were reported, although the highest official report in New York City was 40 miles per hour (64 km/h), with a 54 miles per hour (87 km/h) gust reported at Block Island. New York’s Central Park Observatory reported a minimum temperature of 6 °F (−14 °C), and a daytime average of 9 °F (−13 °C) on March 13, the coldest ever for March.